15mm large diameter, cool blue. Make your eyes beautifully and big today. ColourVue Big Eyes Cool Blue contact lenses not only will give your eyes a beautiful, deep blue colour but will also make them visibly bigger. Thanks to an outer dark circle, they provide an amazing big eyes effect so popular among Asian girls. 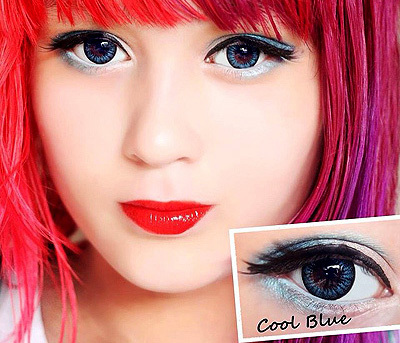 With ColourVue Cool Blue big eyes lenses your eyes will indeed look cool! Your gaze will gain this amazing sharpness that will freeze everybody. ColourVue Big Eyes Cool Blue contacts are great with practically any make up, but will make the biggest impression with no eye make up or with black, evening type of make up. Try them now!